This Guild Wars 2 farming route written in guildwars2economy can be completed in an hour, which is just enough time to let the farmed ore nodes to replenish and repeat the farming route all over again. But then, if you prefer the easy way out and rather not farm, you can also buy Guild Wars 2 Gold. If not, head over to the Bloodtide Coast, the level 45-55 zone just below Lion's Arch, farm for Platinum, Gold and Iron ores, which can then be sold for a handsome profit at the Black Market Trading Company. In case you do not have time to farm your own Guild Wars 2 Gold, purchasing from InGameDelivery can be a good way to go. It is the best shop on our list becuase of their reliability, price, delivery speed, and customer recommendation. These ores are primarily used for crafting high-level profession items. Platinum Ore is used in level 225 Armorsmith, Artificer, Huntsman, Jeweler and Weaponsmith recipes. Gold Ore is used in level 200 Artificer and level 150 Jeweler recipes. While Iron Ore is a prolific ingredient for level 75 recipes. "Going through this route you are going to need more than one Darksteel Mining Pick stacks. The respawn time for the nodes it's about 1 hour but while you will come back to the starting zone the nodes will reappear so you can do it again without any pause," says guide author Khross. Khross provided a helpful map, shown below, annotated with a recommended farming path and ore concentration areas. "As many of you may know, from time to time, the spawn points of the mining nodes change, but following this route you will find anyway lots of ores." 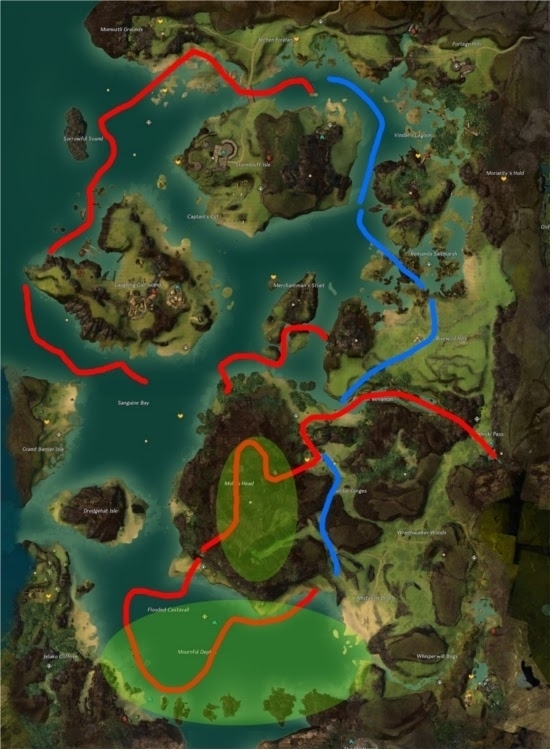 The farming route is on loop, so there is no real starting point, but players will usually begin at Archen Foreland and make their way down in an arc towards Sanguine Bay (path marked in red line). From there, make a zigzag northeast towards Merchantman's Strait and make a quick detour east Mentecki Pass to pick clean some stray nodes. Run back and enter the Mole's head from its eastern entrance for your first Platinum-heavy haul, which Khross has shaded in green oblongs. Exit the cave to the southwest to Flooded Castavall and swim around Mournful Depths for another Platinum ore harvest. Then swim up to the northern beach and make the final trek back to the initial starting point (path marked in blue line). Depending on how fast it took you to finish the route, you may have time to head back to town to conduct some trading, or you can proceed to start farming all over again. Unlike other iron and gold farming maps, the Bloodline Coast has a lot of underwater nodes. If possible, pick an underwater weapon with fast killing and movement speed to allow you to quickly dispatch enemies and traverse the waters. For those who want to focus exclusively on farming Gold ore, mmorpg-life.com has marked down all the Gold ore locations across all Guild Wars 2 maps, starting from the level 30-40 Fields of Ruin zone up to the level 50-60 Iron Marches and Timberline Falls zones.